This handy belt sander has a three-position belt sanding head and variable speed control to make it ideal for most shaping and sharpening applications. 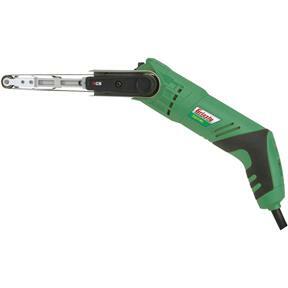 984-1804 FPM belt speed and double insulated construction with an ergonomic grip. 2 amps, 2.2 lb. weight. Just need diamond belts for concrete figures. One of the differences between this sander and Harbor Freight's is the Grizzly has multiple speeds and allows you to control the cutting better. The unit appears to be a quality item and I am pleased with its purchase. Mounted sander in custom holder on my G0752 lathe,.Can now grind to exact tolerances, and the finish is great. As stated THE PERFECT TOOL. I bought this a month ago and I wish I had bought this a year ago. 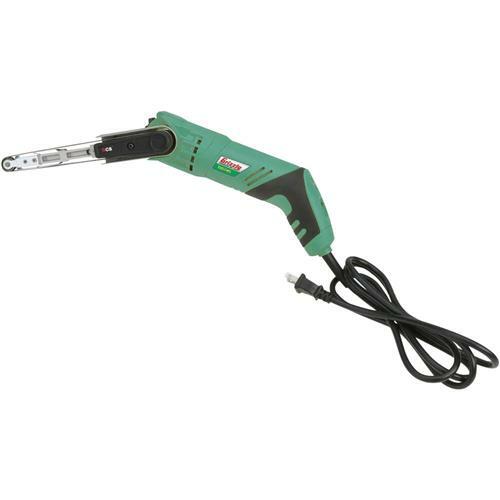 It performs great and saves me hours of sanding time spent on my projects. Great product! Got this sander to sand in tight places on a bench. It has performed very well. The only thing I have noticed is that the motor tends to get rather hot if you sand for more than a few minutes. It also may had been because I was using 60 grit paper to remove and oldfinish. Other than that it is an excellent tool. This is a replacement of one of lesser quality. I use it daily for business and at home. 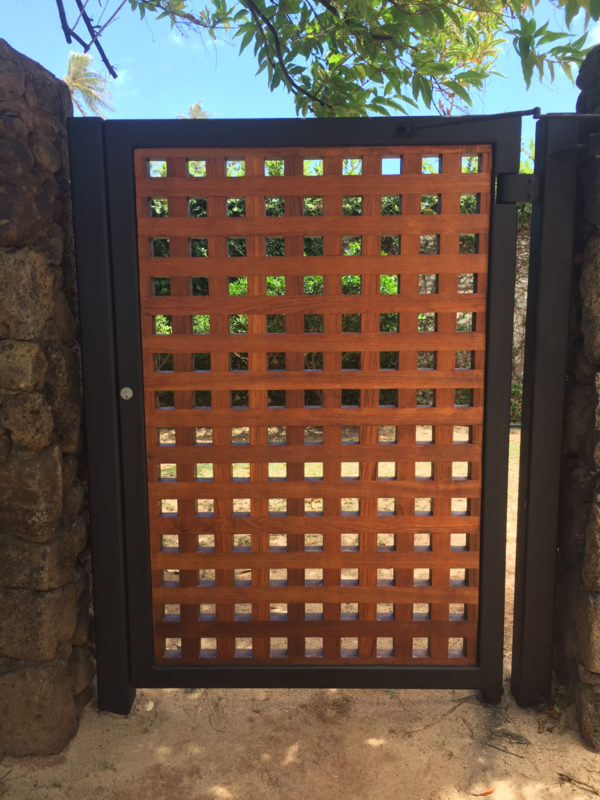 A great tool to reach hard to get at and small spaces. I would recommend this for those who need it. Love this thing. I was working on some rough, deep mortises and needed to clean them up a bit and was wishing I could just have a narrow power sander instead of spending a day with hand file or short chisels. I know a sharp chisel would be ideal. I have a good set of chisels but they aren't long enough for this mortise -- I could spend a couple hundred dollars on some good mortise chisels or, maybe a sander would do it. I have a Fein Mulitmaster but even at $300 it doesn't do everything. 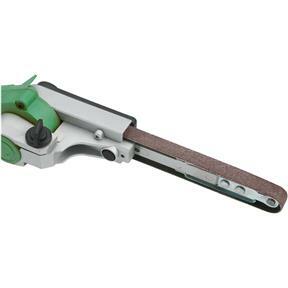 I see this Grizzly handheld belt sander as functional as the Multimaster ... and to me that's saying a lot! Solid performance, and great value! Not one problem! Took just a few minutes and I was done. Using it for hard to access sanding on an outboard motor and for some wood carving. Neat tool. Very good product that is very handy in model building. Fills a big gap in my shop, since I do not have room for a larger belt sander. 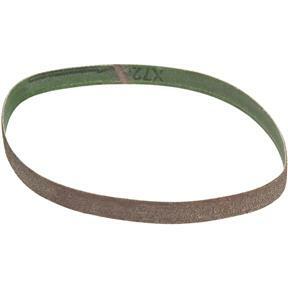 McMaster has a variety of finer grit belts, so you are good from 80 to 400. I have a lot of wrought iron railing. I used to sand it with a grinder, but because of the layout, angles, etc., was never able to do a great job. I saw an auto mechanic's 1/2x18 pneumatic sander and bought one. I have a large compressor, but the sander used so much power, the compressor ran all the time. I purchased this electric one and it has eliminated that issue. It runs well and doesn't get too warm even after roughly 2 hours of straight use. The belts are very easy to change, fits in small places and makes a job like this much easier and the quality much better. The only drawback i've noticed is that in the confined spaces i'm using the sander, the belt slips off and I have to stop and put it back on - this process takes 15 seconds. Works good so far. 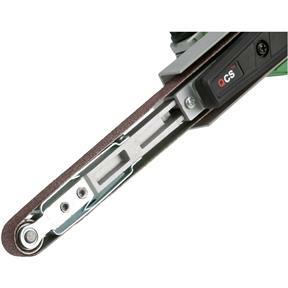 Belt change mechanism could be easier. Good value and common belt size. Inexpensive enough that I bought two for the shop so one doesn't have to be shared. I am building a lapstrake sailboat and this is the best tool I have found to sand the tight corners created with this type of construction. I appreciate the fact that you offer specialty tools along with your regular line and I have been very happy with your machines quality and price. I have been buying Grizzly tools for 20 years and have yet to be disappointed. Thanks again. This was a birthday present and I am pleasantly surprised at how great the sander is. Have not used a lot, but for the work that I did it performed well. Bought to sand tight spaces on the bandsaw boxes I build. It works great. I'd give it five stars but the handle gets very hot and uncomfortable after a few minutes of sanding. I bought this sander with 60 grit belts for rough shaping of handles on the knives that I make. 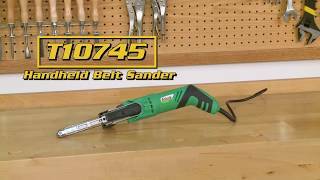 This sander works great and saves a lot of time. Works great on all handles materials such as Canvas and burlap Micarta, G10, bone/antler and hardwoods. Haven't had the need to put this to work on any metal materials but I am sure it would work great for that also. Be sure to wear respiratory and eye protection because this thing puts off an insane amount of dust! I use it on self-bows and fiberglass laminated longbows to shape the handle and arrow shelf. Works wonderfully and reduced my completion time. This is a handy sander. We are using it on a tree farm to sharpen a tree digging spade. It would be nice to have one of these with a one inch wide belt. This sander workes for getting into tight spots. Liked it so much we even ordered one for the cottage. 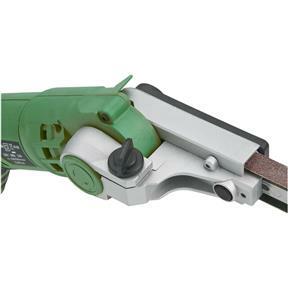 This is a great little belt sander. 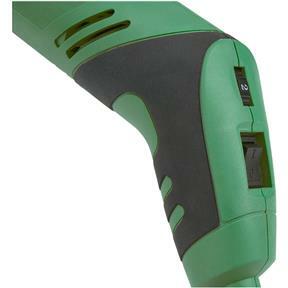 It gets places other electric tools cant reach. 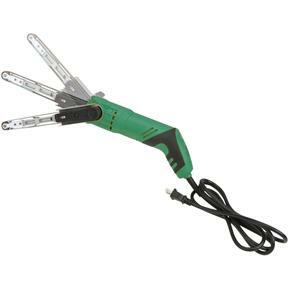 It can clean up the edges of a square hole as small as 3/4", and is very handy. The only issue that I have is that it's a little underpowered. That being said, I do mostly steel fabrication so I tend to put tools through the wringer. 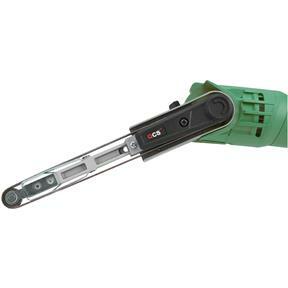 Very useful, manageable little tool, that can dig holes, needs be. Over the top area, belt coming at you one side, going away other side enables reasonably tight access, without tying itself in knots, with a little getting used to.I do small hardwood carvings, this tool gives me shaping capabilities I didn't have before. It has also proven it's worth on larger, deck, stair railing type projects.